Saving tiny Hearts Society was founded by Francie and Brian Paul after their son Joshua was born and diagnosed with severe complex congenital heart disease. On August 11, 2005, we had our first child, a beautiful baby boy named Joshua Bennett Paul. My pregnancy was “normal” and my doctors reported nothing “remarkable” about it. As it turned out, there was nothing “normal” about my pregnancy and it was incredibly “remarkable” after all. Four hours after his birth, Joshua was rushed from the local hospital where he was born to Children’s Memorial Hospital in Chicago. 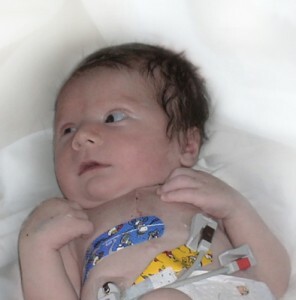 Joshua was diagnosed with Severe Complex Congenital Heart Disease. Like many parents in our position, we became very angry and once the dust settled we considered litigation as a course of action. After meeting with high-profile medical malpractice attorneys, we decided this route was not for us. In the elevator on the way out of one attorney’s office, we called Brian’s corporate attorney to find out how to start a public charity. We felt channeling our energy into something positive instead of something negative would be a much more effective and fulfilling way for us to focus our efforts. On September 1, 2006 the United States Internal Revenue Service officially recognized the Saving tiny Hearts Society as a tax exempt 501(c)(3) organization. The entire process to attain this classification took one full year. Our fundraising efforts began when we applied to the federal government. We are proud to say that we are one of the United States most efficient organizations by continuously maintaining an operating overhead of under 10% of our total revenue. We are comprised of a determined board of directors, a distinguished Medical Advisory Board and many wonderful volunteers who share the passion for helping to save the lives of these children born with congenital heart defects. Saving tiny Hearts Society has no paid employees. The research you are funding today will save the lives of countless children tomorrow. Your support of the Saving tiny Hearts Society will make a difference and change the future of medicine. The medical research we are funding heralds medical advancements necessary for preventative measures and better medical treatment for those born with congenital heart defects.